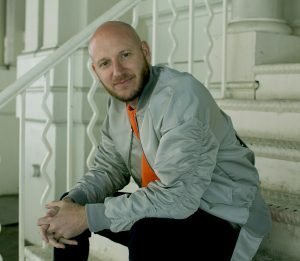 Jonni Pollard is best known for his meditation business, 1 Giant Mind, and his app, Learn Meditation. In his first book, Pollard explains that the modern way of living is far removed from our evolutionary past – and causes us to seek out distractions and ways of self-medicating to ease our internal conflict. This inner conflict is caused by a disconnect between our experience and our true selves. Pollard also introduces the Vedic tradition of meditation and yoga. Sacredness of life – The idea that humans depend upon the earth to exist, and so we should also view its resources as sacred. Also, the idea that our lives have meaning and it is our responsibility to contribute something to the world. Humans are loving– The idea that we are all responsible for taking care of our fellow humans. A point that is even more important in today’s political climate. 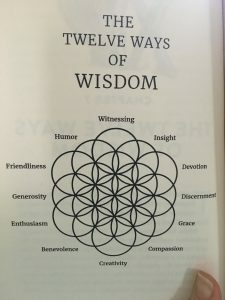 The twelve ways of wisdom are pictured below. The ways of wisdom include witnessing, insight, devotion, discernment, grace, compassion, creativity, benevolence, enthusiasm, generosity, friendliness, and humor. Each of these traits are explained through useful stories and insights. I appreciated all of them but my favorite insights were discernment, compassion, enthusiasm, and generosity. Discernment is what allows us to make choices about which parts of our life and experiences are helpful to us, and which are detrimental and should be ignored. For example, as you scroll through Facebook you might start comparing yourself to others in your mind. These thoughts and feelings are fleeting, so you can discern, or filter that experience and move on. Discernment allows us to notice the difference between feelings, behaviors, and thoughts that are healthy for us and those that are not. It is a skill we can all practice, a form of mindfulness. Compassion is the ability to really hear and respond to the suffering of others. Compassion is not pity, or trying to fix another person’s problems. See my post on personal growth. Listening with an open heart and allowing someone to pave their own way is compassion. A well-trained coach can embody compassion. There is no judgment with compassion, just the ability to see another more clearly than he sees himself. Feel Better Fast is designed with this concept in mind! Enthusiasm springs from our “why” and our sense of purpose. This is also the trait that allows us to engage with other people in a meaningful, authentic way. Generosity is a way of moving through the world without expectation of specific outcomes. I confess that I have always considered myself to be a generous person. But I have struggled with trying to control the outcome of my efforts. So this particular way of wisdom meant everything to me. I decided after reading this section of the book about ten times that I should be more generous with my attention in my free Facebook group, despite having been told I shouldn’t “waste time” on tasks that don’t support my business. Shifting my mindset in this way allowed me to be a better, less judgmental community leader. 4) Our life’s purpose is fulfillment– The idea that we often get mixed up and expect our life’s purpose to fulfill us. Think of it like this – The work you are doing is less important than how you show up to do that work. How you show up includes the way you interact with others, how you bring people together, and how you make other people feel. You create your own fulfillment by showing up for the other people around you. What do you bring to your workplace? Or your life? The Golden Sequence is not the typical feel good, quit your job, follow your dreams sort of book. Though on the surface it might look that way. It’s a book about creating your own sense of fulfillment. Pollard also explains that human suffering, or what we perceive as suffering, is basically about fear. Fear of death, fear of powerlessness, fear of suffering, and fear of isolation. Pollard theorizes that these fears cause us to live in a defensive mode where we spend time creating thoughts and belief systems that separate us from other people. As you can imagine this creates a cycle of behavior and beliefs that keep us stuck and unable to find fulfillment. The end of the book is where Pollard lays out a specific five-step technique for living a more fulfilled life. Having ADHD – I like the specific nature of his directives and examples. 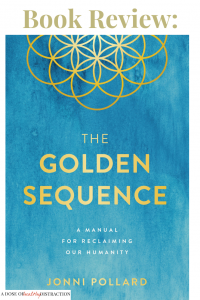 The Golden Sequence is a fast read and it will appeal to the spiritual seekers of the world. The book is good for anyone who is familiar and interested in mindfulness and personal growth. There is an emphasis on meditation as well. The book probably won’t work for anyone who doesn’t see or believe in the interconnectedness of all humans and the earth. Not everyone is ready to open their hearts and minds to the ideas in this book, but the people who are will find exactly what they are looking for. « Can Untreated ADHD Shorten Your Life?